Rocklandscapes unfold their true and cosy characteristics when combined with water. Banks of ponds designed with rocks, waterfalls or fountain sculptures: they all have something in common: combined with the splatter of water in the background, they seem to be a bessing for our overworkes soul. A pond in the garden is all the year round beautiful. As a ornamental or swimming pond it offers different beings a habitat. Enjoy the vividness and the variety of our domestic nature. In a properly arranged pond nature finds its balance and chemicals and cleaning as it is with a traditional pool isn’t neccessary any more. Sich bewegendes Wasser gehört zu den faszienierendsten Schauspielen der Natur. MEGASTONE Felslandschaften eignen sich sowohl zur Gestaltung von Springbrunnen, als auch für Wasserfälle, Bachläufe oder Kinderrutschen. 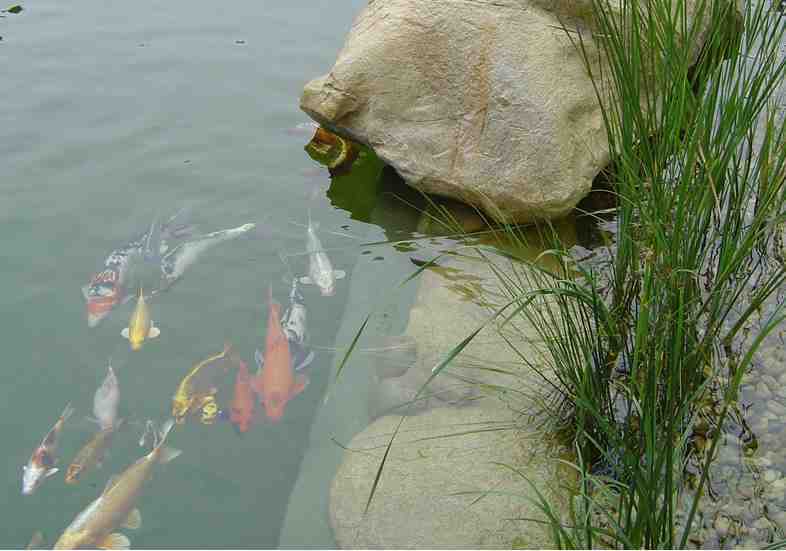 Having ornamental fish means that a lot of conditions have to be accomplished for the pond. MEGASTONE is an expert in designing Koi-ponds. Just sitting near the pond and watching your fish is a soothing relaxation. We’d be pleased to make you an offer – just contact us.